Heading into 2009, bacon was the hot culinary trend. We’ve seen chocolate covered bacon, deep-fried bacon, bacon cupcakes…you name it. There are even bacon band aids. "A new generation of lunch trucks is hitting the streets. They serve high-end fare such as grass-fed beef hamburgers, escargot and crème brûlée. As they rove cities like Austin, New York, San Francisco and Los Angeles, they alert customers to their locations using Twitter and Facebook. Their owners include highly trained chefs and well-known restaurateurs." Reader Amy is throwing up in her mouth over her fear of food carts, but a lot of reporters are giving these pop up eateries glowing reviews. And the food is said to be excellent. I’m not talkin’ hot dogs folks. These carts are decked out with vegan burgers, fancy treats, gourmet tacos, etc. 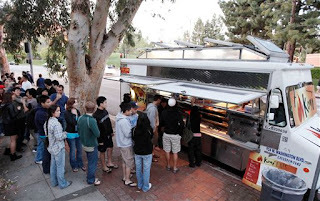 The Web Site Jaunted covered LA’s gourmet food truck scene with The Border Grill Taco Truck. The Clover Food Truck in Boston serves organic and vegetarian foods to MIT students. 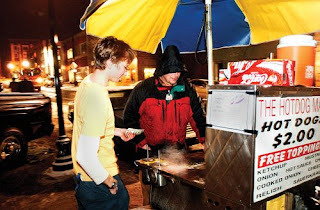 Gosh, all we had at WVU was the hot dog man (right). Even Sprinkels Cupakes is even jumping on the bandwagon, with an on-the-go truck!